Codominance occurs when two versions, or “alleles,” of the same gene are present in a living thing, and both are expressed. Instead of one trait being dominant over the other, both traits appear. Codominance is easy to spot in plants and animals that have more than one pigment color. Spotted cows and flowers with petals of two different colors are examples of codominance, for example. Codominance also occurs in some less visible traits, such as blood type. The A and B alleles for blood type can both be expressed at the same time, resulting in type AB blood. In genetics, “dominant” genes are those that are always expressed if they are found in an organism. Dominant genes may be expressed as co-dominant – where two different traits are both expressed alongside each other – or as dominant/recessive, where the presence of a dominant gene completely masks the presence of a recessive gene. When a chicken with white feathers breeds with a chicken with black feathers, the result is an offspring chicken that grows up to have both black and white feathers. Rhododendrons and other flowers may also exhibit codominance. In the case of rhododendrons, the crossing of a red and white flower may yield a flower that has both red and white patches. Many flowers show similar patterns of codominance, where both of the parental flower colors show up in different parts of the plant. An example of codominance that occurs in humans is that of blood type. There are three different versions of the gene for proteins that appear on the outside of our blood cells and help our body to identify the cells as their own. These alleles are A, B, and O. The “O” allele actually does not code for any protein at all, so people with the “O” trait lack both A and B proteins. The A and B proteins, on the other hand, code for two different proteins. These proteins, like different colors in a flower, can appear together. Someone who inherits an A allele from one parent and a B allele from the other will express both proteins in a codominant fashion, resulting in an AB blood type. The “O” trait, on the other hand, is a good example of a dominant/recessive relationship: if either A or B is expressed, the “O” trait is not expressed. Allele – A “version” of a gene. Different alleles are different “versions” of the same gene, such as the blue and brown alleles for eye color in humans. Dominant – A gene whose trait is always expressed when it is present. Recessive – A gene whose trait may not be expressed if it is masked by the presence of a dominant gene. 1. Which of the following is NOT an example of codominance? A. A child of parents with blood types A and B, who has AB blood type. B. A calf of a red cow and a white cow, who has a roan coat consisting of red and white hairs. C. A child of a parent with blue eyes and a parent with brown eyes, who has brown eyes. D. A flower offspring of red and white flowers, which has both red and white petals. C is correct. This is not an example of codominance, because the child does not express both parents’ traits. She only expresses the brown-eyed gene inherited from one parent. 2. Which of the following is NOT true of dominant genes? A. Dominant genes are always expressed wherever they are present. B. A dominant gene will overpower all other genes to be the only one expressed. C. Two dominant genes can be expressed together in a situation of co-dominance. B is correct. Dominant genes can be expressed together in situations of co-dominance. The presence of one dominant gene does not mean that other dominant genes can’t be expressed. 3. Which of the following blood types is NOT a dominant trait? C is correct. 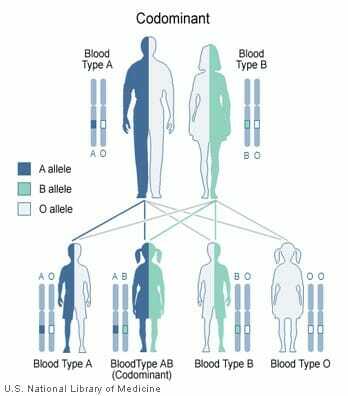 Blood type O is a recessive gene that can be masked by either A or B alleles. The A and B alleles, on the other hand, are dominant genes that will be expressed wherever they are present.